Bold and overized, these Kendra Scott earrings add just-right drama to everyday outfits. 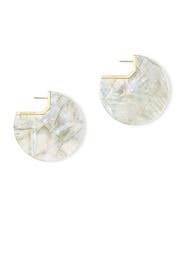 14K gold plated hoop earrings with ivory mother-of-pearl stones. Post backs for pierced ears. 2.3" long.